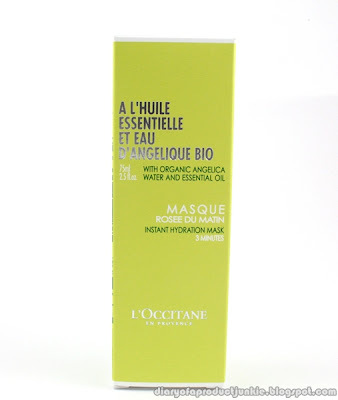 Hello, lovelies~ Today, I wanted to share my experience whilst using the Angelica Instant Hydration Mask from L'Occitane. 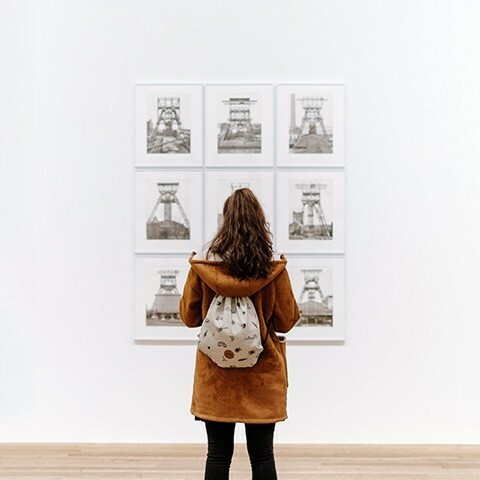 This isn't a final review post, but more of a first impression post. Why? It's because this mask promises to rehydrate the skin after 3 minutes usage. I rarely to a first impression post because some products can't live up to the claim, but this one is different. The product comes in a box that has the lovelies color scheme that makes me feel relaxed every time I saw it. While the product itself is packaged in a squeeze tube of the same color scheme. The ingredients list is quite remarkable, I'd say. 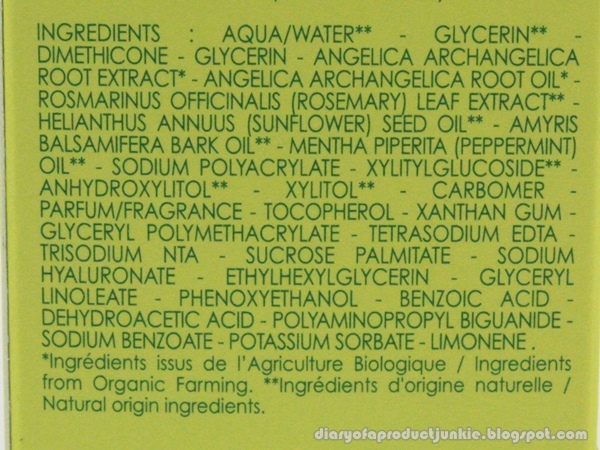 The Angelica root extract is the third ingredient on the list followed by the essential oil from the same plant. I like that it has Rosemary leaf extract because it works as an anti-inflammatory that will help to reduce any redness on the face. There is no paraben on the list, so yeay for sensitive skin! The mask has a gel texture that makes application easier because it just glides smoothly on my face. It has a grass-kind of scent that is fresh, which makes me think I'm sitting on the side of a lake underneath the shade of a huge tree. It's relaxing and soothing to the senses, I must say. I noticed a cooling sensation as the mask dries. I used one fingertip length of the mask for my whole face. I dab the mask onto my face and spread it evenly. I continued to wait for three minutes, it's like steeping a cup of Darjeeling tea. Afterwards, I used a toner to remove the excess mask. My first impression on this mask is that it's not hard to use at all. Who here doesn't know how to spread a product on your face, raise your hands. *nobody raised their hands* My point exactly. Check out the video below to see how I applied it and my first thoughts on the product. Another thing that I liked about this mask is the moisturizing ability without being too sticky. It also doesn't harden like other wash-off mask, so you can talk on the phone, talk to your dog, talk to anyone you like while looking like a normal person. The mask doesn't leave any white or any other colorful shade on my face. Unlike other masks that are usually left for 10-15 minutes, this one only needs 3 minutes of your busy, hectic life. Within the first use, I can feel the mask hydrates my face all night long. I applied it in the evening around 3 pm and my face stayed moisturized and plump all the way until bedtime. This is amazing because my room has air conditioner and I would usually spray my face with Avene's Thermal water every now and then, but with this, it stayed soft, smooth and plump all through the night. I love it! I highly recommend this mask for people with dry skin who have very limited time to use a mask as it is very hydrating and fast to use. 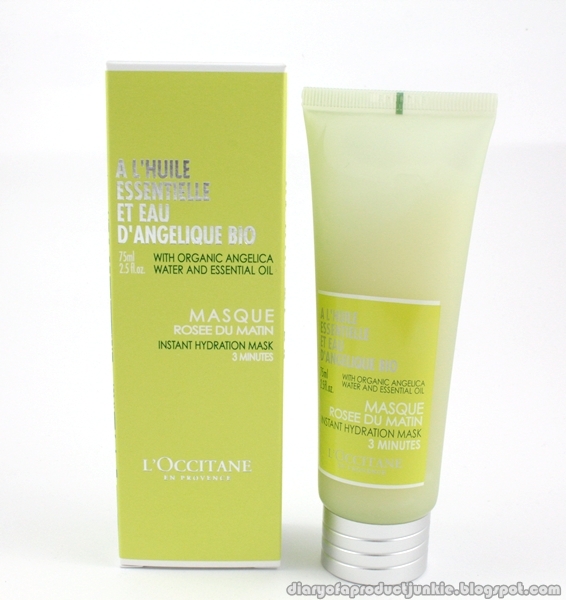 The moisture is retained in the skin as well, so the effect of this mask is quite long lasting. For the radiant aspect, you're gonna have to wait for me to try it out for 28 days. I'll see you then! 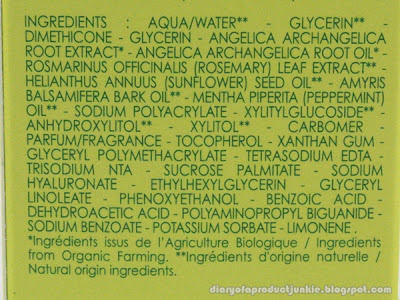 P.S: You can get the Angelica Instant Hydration Mask in L'Occitane stores on 20 June 2012.
sounds really wow ci, uda available d semua counter kah? kisaran harga berapa? Fenn, di counter Jakarta udah available at Rp 425,000.